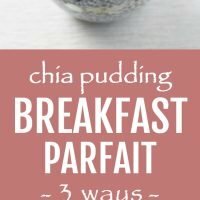 This chia pudding breakfast recipe is very easy to make and super versatile. Make the Very Berry Chia Parfait, Apple Cinnamon Chia Parfait, or Mango Coconut Chia Parfait or adapt the recipe to match your dietary and taste preferences. 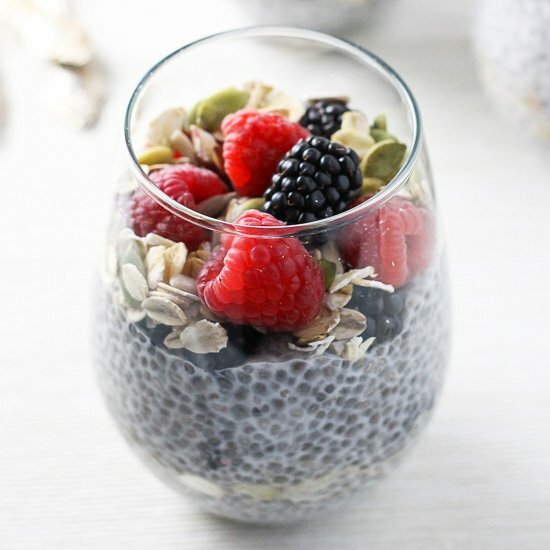 Chia seeds are packed with nutrients and chia pudding has become a very popular breakfast food among health-conscious consumers. 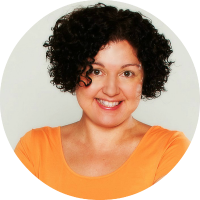 Unfortunately, the recipes for chia breakfast and chia desserts are often used interchangeably which is wrong because chia desserts are usually sweetened and often contain higher amounts of sugars. 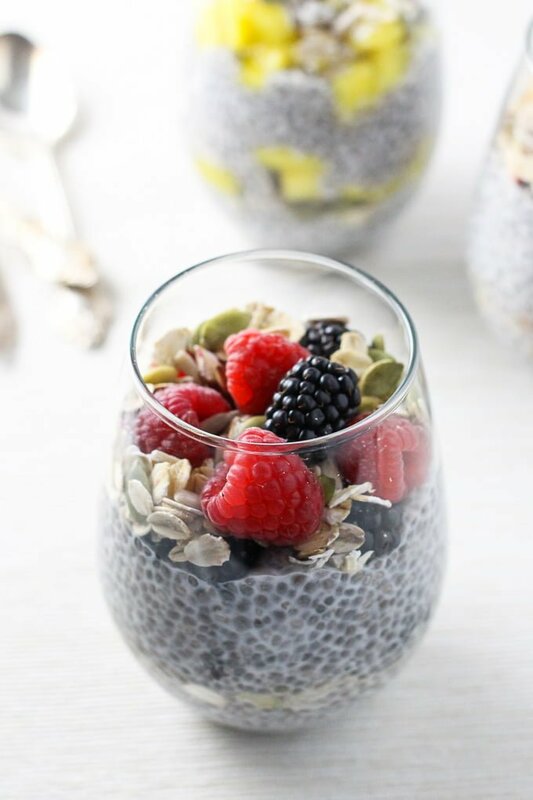 Chia desserts are still delicious and healthy, but they are desserts and not breakfast foods especially if you are trying to consume less sugar. That’s why I decided to make this chia pudding breakfast recipe without any added sweeteners. Instead, you get to enjoy the real flavors of berries, mango, and apples. 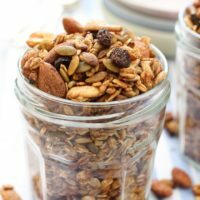 Eating less sweetened foods especially for breakfast helps us to train our taste buds and teaches them to enjoy real flavors that aren’t enhanced with sweeteners. 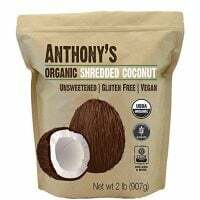 If you are new to the concept of eating less sugar and your taste buds haven’t adapted yet, you can add a small amount of natural sweetener to the chia pudding. My favorites are maple syrup and coconut sugar. Honey is also good but lends a strong honey flavor to the chia pudding. This chia pudding breakfast variation is made with berries. I added raspberries and blackberries. But it will also taste great with strawberries or blueberries. 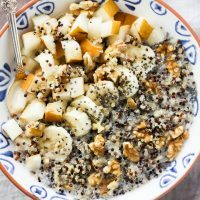 This chia pudding breakfast variation is based on the classic flavor combination of apples and cinnamon. I think if you add unsweetened applesauce instead of apples, it will taste amazing too. This chia pudding breakfast variation is based on tropical flavors of mango and coconut. I think it will also taste amazing with banana or papaya. Mix and match fruits and berries to experiment with different flavors. 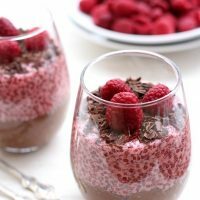 And if you like chia pudding based desserts, check out this Chocolate and Raspberry Chia Pudding. It has four recipe variations that you can make using the same ingredients. 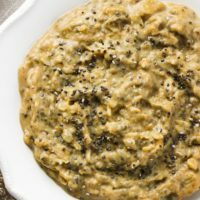 This chia pudding breakfast is easy to make and very versatile. It's sugar-free and sweetened with only fruits and berries. 3 delicious flavor combinations. 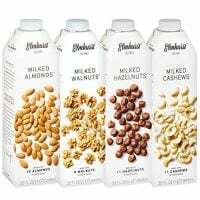 Pour the milk into a jar or a glass container. Add the chia seeds and stir with a spoon. Let it stand for about 10 minutes then stir well one more time. Place the jar into the fridge and let the chia seeds soak for at least 4 hours or overnight. 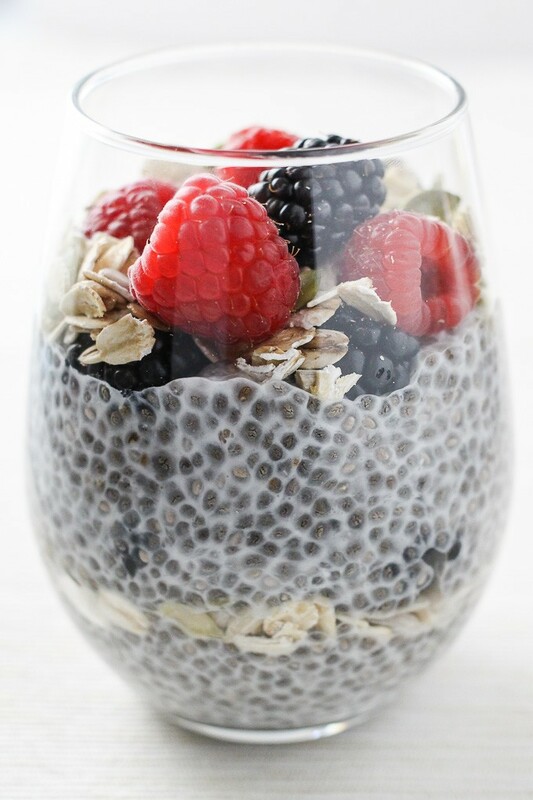 In a jar or glass, layer the chia pudding, berries, rolled oats, sunflower and pumpkin seeds. 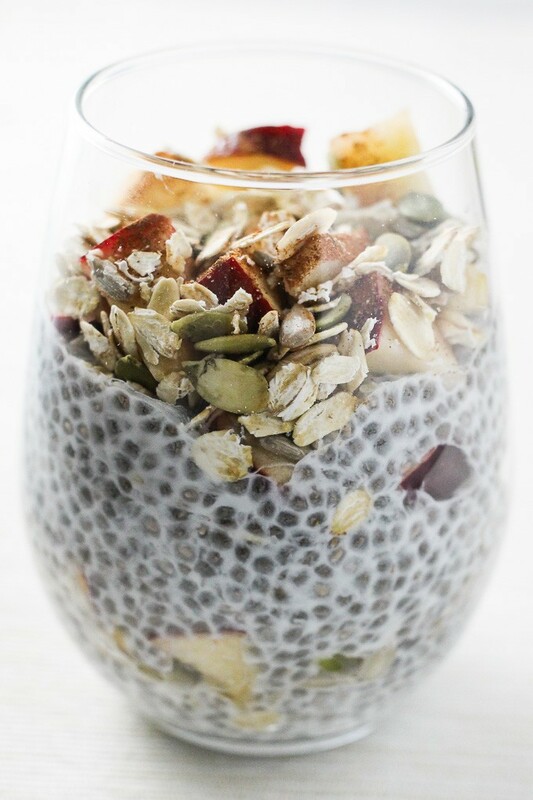 In a jar or glass, layer the chia pudding, apple slices, cinnamon, rolled oats, sunflower and pumpkin seeds. 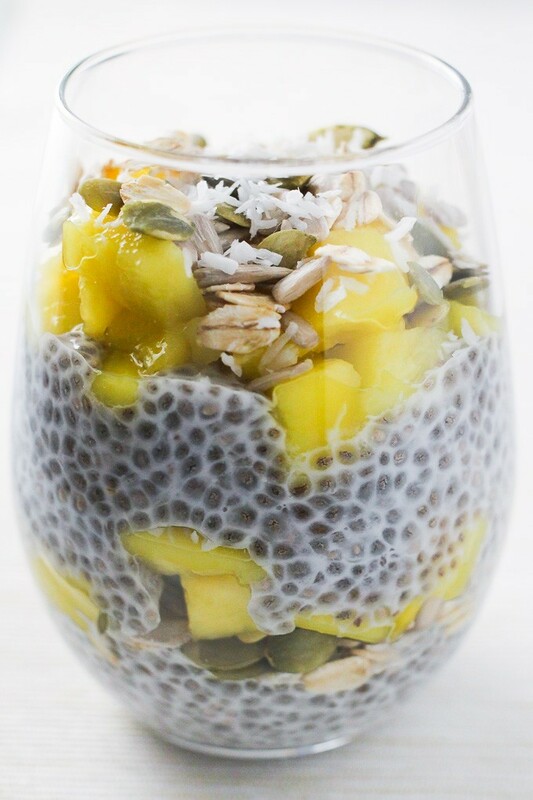 In a jar or glass, layer the chia pudding, mango, shredded coconut, rolled oats, sunflower and pumpkin seeds. Nutrition information is a rough estimate for the Very Berry Chia Parfait made with almond milk. 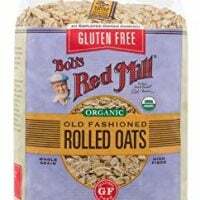 My family has added this into our breakfast rotation and I love it for several reasons. First, this is a perfect cooking project for toddlers and young children as they enjoy stirring the milk and seeds and the layering aspect. Also, it can be made the night before to be quickly grabbed from the fridge in the morning rush. I’ve been making it with coconut milk and it tastes great. I’m really enjoying your recipes and photos. 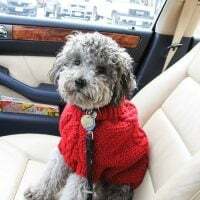 Thanks so much for creating this blog. 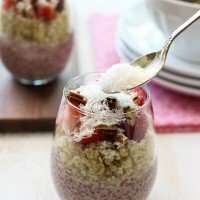 I have a general question about chia pudding. 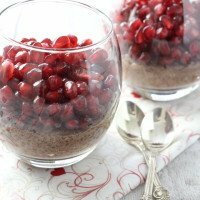 Once it has been fully soaked, is it possible to use a blender, especially an immersion blender or “magic bullet” type blender, to make its consistency smooth? I’ve tried it in my little Ninja blender (which has a high speed and very sharp blades) and it didn’t work. 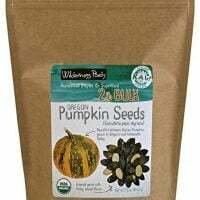 I did soak the seeds for several hours first. And I see from your photographs that the seeds are still visible. So does that mean it’s not possible to blend the mixture into total smoothness? Or is there some technique for doing it that I don’t know about? Thanks! This is an interesting question. 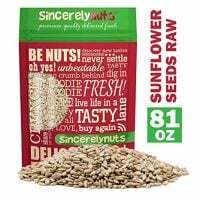 I’ve never tried to blend soaked chia seeds. 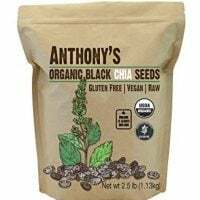 I’ve also noticed that most people use whole chia seeds. I did try to soak ground chia seeds. For a pudding, I think whole chia seeds have a better mouthfeel but if you want to blend them into a smoothie maybe try to soak ground chia? I can’t stop reading all about your recipes , and your information on eating right. Can’t wait till I can get your cook book.